My answer: Yeah, Kind of. In the long run, hate will almost always undermine excellence. The best people in any pursuit or profession are usually obsessive. They work crazy hours because they’re doing what they love. They don’t fill out mental timesheets, counting down the minutes until they can ditch the task or check it off the to-do list. Instead, they get so caught up in work that it doesn’t feel like work at all. For the greats, profession and passion coincide. You can’t just enjoy the knowing, the being good, the destination you’re seeking. You have to enjoy the learning, the becoming good, the voyage you’re taking. Even in math class, excellence is a journey, and natural ability is only a starting point. If you don’t like to drive—if you keep asking “Are we there yet?” every 45 seconds—then it doesn’t matter how fast your car can theoretically go. You probably won’t make it too far. 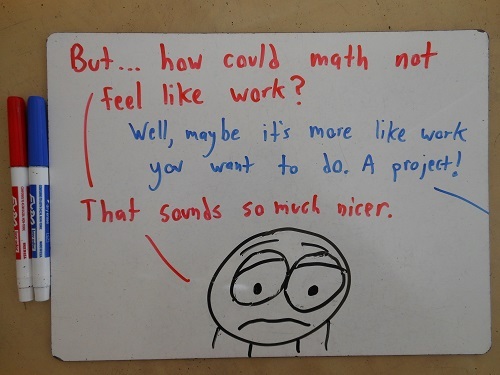 Loving math—or at least enjoying it—isn’t everything. But a little affection for the subject makes it a whole lot easier to thrive. Previous Post Why should we use proofs in the first place? “For the greats, profession and passion coincide.” Nicely put pal. Quite wel written. N wel, hmm, drawn too. The shame of it is, where are they supposed to get their love of math from in the first place? For me, once I understood it I loved it. Before that, I wanted to kill it with fire. Baba: “Drawn” is a generous word to use. gfrblxt: It’s a good question. The list of lovable math stuff in the last panel is a start. 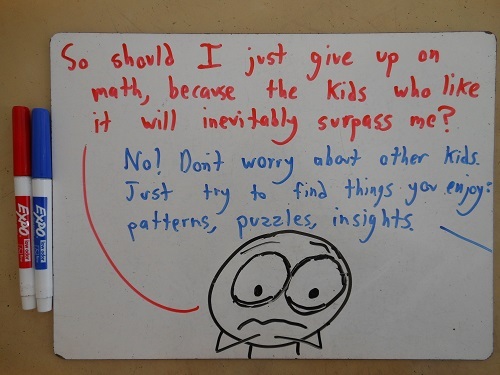 Kids also, I think, have a natural love of solving puzzles and feeling smart – which math class can offer. modernidiot: Fair. I think we’ve all wished a fiery death on a confusing topic. Empty Notebook: Glad you enjoyed it! Probability is really cool stuff. I recommend Leonard Mlodinow’s “The Drunkard’s Walk” if you want a good history, and this book whose author escapes me called “50 Probability Problems” (or somesuch thing) for some cool puzzles. I think you’ve written some darn good life advice here, for math and almost anything else we hate. I would personally substitute organic chemistry and doing income taxes for math, but you’ve given me some practical advice on how to at least make them less detestable. We’ll see if I can come up with anything to like about income taxes! Not sure how you managed to create such a flawless recreation of my grade-school-year’s-self. I mean, the resemblance is uncanny! 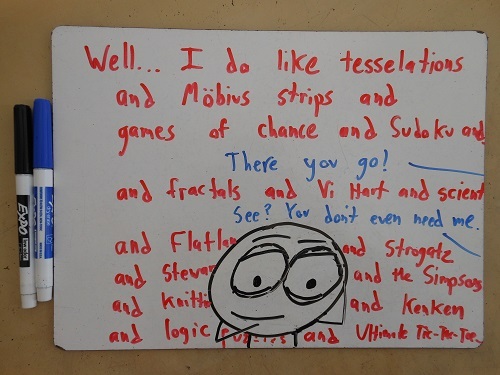 If you hate math, it could also be that you were never shown its mysteries. 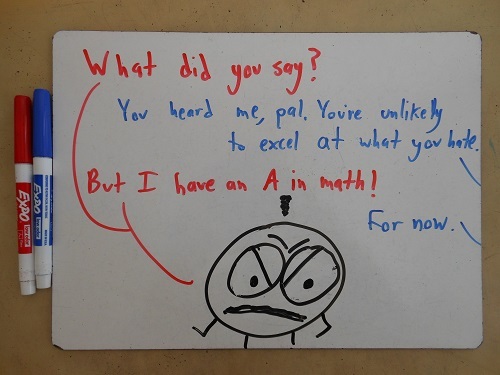 I didn’t particularly enjoy math during my elementary school years. What I was taught was a boring collection of procedures. It was only later that I learned about mysteries such as the distribution of prime numbers–there’s no simple equation that will tell us whether or not a given number is prime. Mathematics has since turned from a boring subject of mindless procedures to a mysterious subject worth exploring.